The document appears to reflect a discussion about the prospect of a Norway trade deal, which is a member of the European Economic Area. It says: “Why no Norway – two elements – no ECJ intervention. 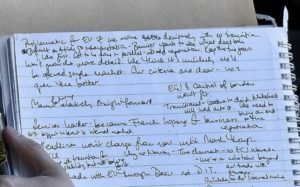 Unlikely to do internal market.”Whitehall sources said the memo was a note of comments made at a meeting between Conservative party officials and representatives from the Dutch ruling VVD party.